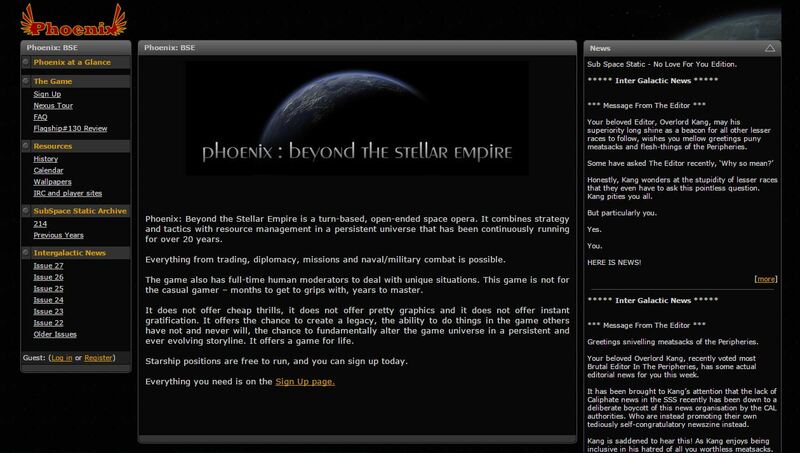 Phoenix: Beyond the Stellar Empire is a sci-fi strategy and resource management game. Suited to browser gamers that enjoy controlling large numbers of detailed assets. Game does not offer fancy/modern graphics, but it does provide something better. It provides frequent updates, interesting gameplay and helpful moderators. Connects you with nostalgic community where new players will get a warm welcome. Once you are in, you find yourself doing missions, trading, managing diplomacy and increasing your military power. Visit Phoenix: Beyond the Stellar Empire website! I recently started and it is complex but exactly what I’ve been looking for. 5 stars so far. Its a complex game with a learning cliff. However it wins all round as in the end easy games are over in a short while once the challenge has gone. Phoenix is dynamically changing based on player activity week to week and your actions will have real consequences. All this backed by real full time GMs to maintain balance and fair play. Not exactly one for those looking for a quick fix but people who want to play for longer term goals and earn something of value and feel achievement it is incredible. This is a lovely game to have ticking along in the background for anyone who enjoys science fiction, strategy and role playing. It all works through a nicely put together browser that you can access anywhere (on the train, at work etc). It’s an incredibly detailed and rich environment with an active and helpful community and a GM who hand moderates certain aspects of the universe so the only limit to what you can do is your imagination. When you first try it it can seem incredibly complicated, but stick at it, take your time and slowly learn from your mistakes and within a couple of weeks you will have a hugely satisfying turn-based adventure to enjoy for years to come. A game I’ve dropped-in and out-of over the past five years, but the depth is absolutely phenomenal. There’s something for EVERYONE to do, and always something to aim for, and a fantastic community to bash ideas against, wield your political might, stir tensions, build allegiances, shoot things, steal things, sell things. A truly immersive text experience. Been playing this game for a while now, and really like it, although the game is really slow in the beginning. But once you have gotten more ships, get involved in the political struggles of the Peripheries and whatever path you choose to take, you can find yourself spending hours giving out orders to your ships. One of the most open ended games I know and one which you can take at your own pace without being dominated by the power gamers that hurt most others. Give it a go but take things easy at first – it is easy to overload yourself with stuff to do when taking over/defending the galaxy. I have been playing continuously for 20 years, from when it was s-mail turns through to the Phoenix upgrade and on-line turn submission and results we enjoy today. The game has great deth and I am still fining new things and places. Although text based, this is probably the most immersive game I have ever played and one of the few games I currently devote time to playing, after returning from a long hiatus. Open-end, complex (in the sense of plenty of options and ways to approach the game), great community. Highly recommended! Phoenix is a rich evolving galaxy which has been running continuosuly for the last 20 years. The game is constantly being updated and the Nexus (the system you use to play it) is a a great web interface for inputing orders, communicating with players and viewing your results and positions. Phoenix really gives you the opportunity to make your mark on the galaxy and has proven its longevity – there is really no game out there like it. The initial learning curve can be high, though improvements including training missions and updated libraries has helped greatly in that respect it is one of those games that once you get the hang of it you will be so glad you put them time in – I have got years of enjoyments out of the game and look forward to many more years. It also can fit round really life great and you choose the level of involvement you want and what aspects of the game you want to try. Finally it has a very friendly and dedicated community of players which really makes the galaxy come alive and are always happy to help and welcome new players into the fold. If you are one of those old-school text games fan, then this is the game for you. Don’t let the looks fool you, once you progress through the game, you find yourself in a virtual world that has you really addicted. What i love most about the game is the fact that Phoenix has an active game administrator who manages the game and hears out players suggestions and updates the game accordingly. 5 stars for the game!